Last Friday, after closing up, we transformed the library from a quiet research space into a lively performance venue. This was the culmination of our first ever CoLab venture where we devised, led and hosted a project based on music in our special collections. The idea for the project came about a few years ago when special collections librarian Emma Greenwood curated an exhibition about our unusual and extensive collection of catches and glees. Hoping to generate more interest in the repertoire through the CoLab festival, she then approached vocal professor Peter Knapp who kindly agreed to act as co-mentor. Together, they created a project which would not only see some of these little-known works performed but also encourage students to research and present the material themselves – all vital skills for the 21st-century musician. Sessions would be split between research in the library mentored by Emma and rehearsals mentored by Peter. The six singers who signed up for the project now had a real challenge on their hands: in just two weeks they had to go from having barely heard of catches and glees to choosing repertoire, researching its context, learning the music, and presenting the final performance. And all this while reading from out-of-print early editions with their unfamiliar notation, clefs and typography. Needless to say, everyone rose to the challenge and the end result was a fantastic success. Our audience clearly enjoyed the performance and the students agreed it had been a valuable experience. So, we’d like to say a huge thank you to all involved: singers Andrew Woodmansey, Bryony Purdue, Dominic Eatwell, Emily Harwood, Hannah Lee and Anna Chan, and mentors Peter Knapp and Emma Greenwood. Now, what about CoLab 2017? If there are any Trinity Laban professors out there interested in working with library staff and collections on a similar project, do get in touch. We’d love to hear your ideas! This month the Jerwood library will be hosting its first ever project under the CoLab banner. 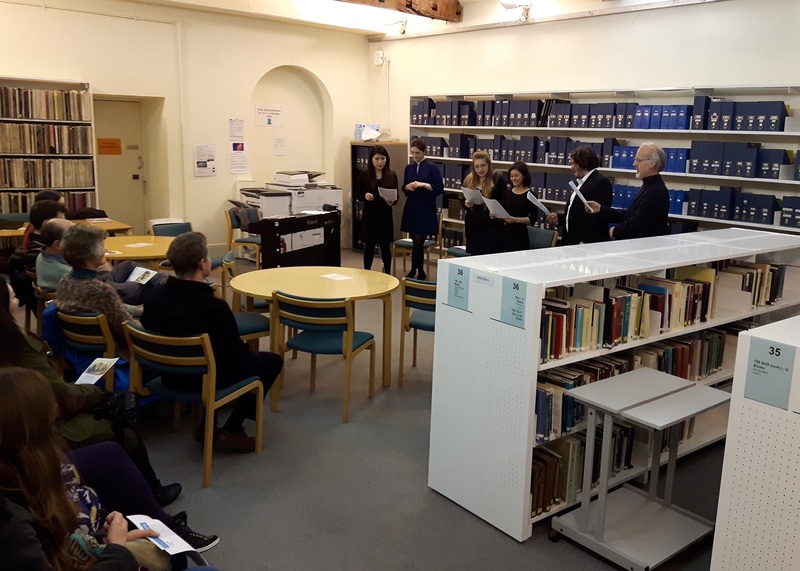 The Jerwood Library Catch and Glee Club will be a collaborative partnership between the library, vocal professor Peter Knapp, and a small group of student singers. 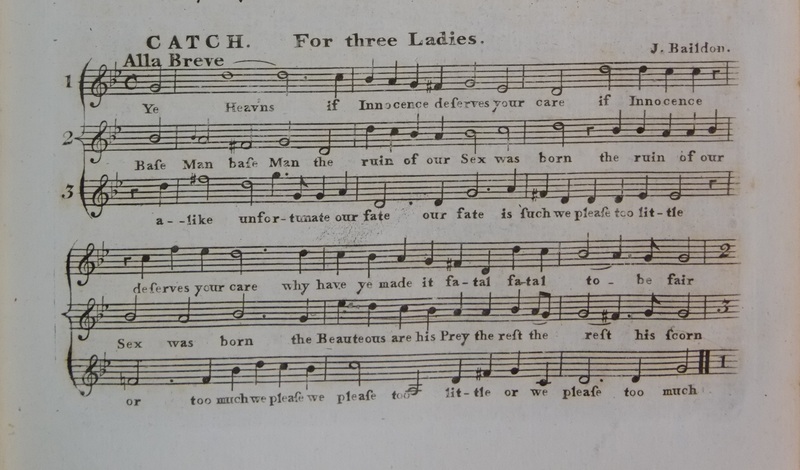 Using material from the library’s extensive catch and glee collection we will bring to life the convivial atmosphere of part-singing in the late eighteenth and early nineteenth centuries. Do join us if you can for the performance in the library at 5pm on Friday 19 February. 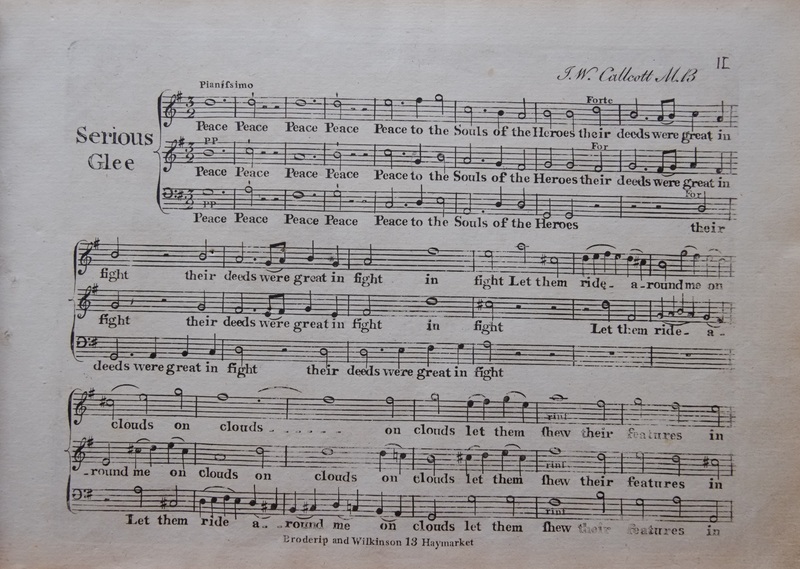 To whet your appetite, this month’s item of the month showcases John Wall Callcott’s glee Peace to the Souls of the Heroes. This was based on the popular text Fingal written by James MacPherson in 1762 but purporting to be a translation from the work of an ancient Gaelic poet named Ossian. This, along with MacPherson’s other Ossianic writings, played an important role in the Celtic revival and in the development of Romanticism. Callcott himself is a less well-known figure these days. Born in 1766, he was a largely self-taught musician who nevertheless became a popular glee composer. In fact, he came to dominate the Catch Club’s annual prize competitions, until they abolished them in 1793. He was also active in the formation of the Glee Club in 1787. Aside from his glee writing, Callcott was an organist, music theorist, and, like other Enlightenment gentlemen, a dictionary compiler. He had a large family and his reputation was secured by his son-in-law William Horsley (also a celebrated glee composer), who published Callcott’s works in a three-volume set prefaced by a glowing memoir.